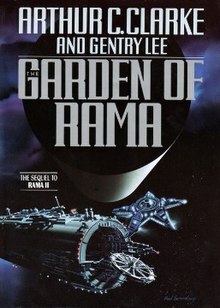 The Garden of Rama is a 1991 novel by Gentry Lee and Arthur C. Clarke. It is the third book in the four-book Rama series: Rendezvous with Rama, Rama II, The Garden of Rama, and Rama Revealed, and follows on from where Rama II left off. The book picks up the story nine months after the end of Rama II. The book follows the story of three astronauts from the expedition in Rama II who were trapped aboard the cylindrical alien spacecraft, Rama II, heading out towards deep space. Along the journey, five children were born. Simone Tiasso Wakefield, Catharine Colin Wakefield, Eleanor Joan Wakefield, Benjamin Ryan O'Toole and Patrick Erin O'Toole, were born by Nicole des Jardins from her relationships with Richard Wakefield and Michael O'Toole. These children later become major characters in Rama Revealed. After a twelve-year journey, they arrive in the vicinity of the star Sirius, where all eight rendezvous with a Raman Node. At the Node they are subjected to physiological tests for a year while Rama is refurbished, and they are eventually sent back to the solar system, this time to collect two thousand more representatives of humanity. An Earth agency, known as the ISA, receives the message from Rama requesting two thousand humans. Upon its reception, the message is kept secret and, under the guise of a new Martian colony, the ISA starts acquiring its payload. The ISA selects a handful of their own representatives; meanwhile, they selectively gather convicts and promise them freedom if they are chosen to be a colonist. The payload is subdivided into three ships: the Nina, Pinta, and Santa Maria (names based on Christopher Columbus's ships Niña, Pinta, and Santa María) that arrive sequentially at Rama. At this point the colonists believe everything is a hoax (despite the colossal size of Rama) created by the ISA. With that discontent as the tone upon their arrival, Rama III heads back to deep space with its new payload. Meanwhile, Rama III determines that total escalation of the conflict is imminent and transmits an emergency signal to its ancient constructors. The book ends with a cliffhanger, on the eve of the execution of one of the original astronauts. Gentry Lee also wrote two further novels set in the same Rama Universe. This page was last edited on 26 September 2018, at 08:54 (UTC).